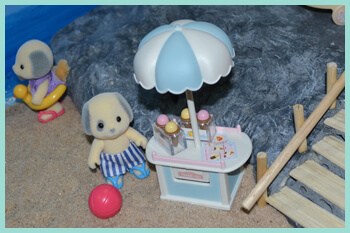 The pages below showcase some of the crafts and projects that I have made for my Sylvanian Families critters. 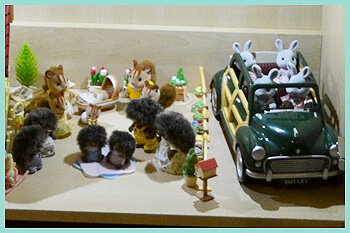 Since I display most of my collection in various dioramas inside my cabinet, I have included some of the techniques, trial and errors and successes that I have had while building and maintaining my Sylvanian Families displays. My attempt at reving a faded old Sylvanian Families canal boat. Sometimes bunny tails get damaged... I don't judge. But I do try to fix them where I can. My first attempt at creating a tree from scratch. I have since given up on this method and will rather stick to plastic foliage as it is less messy. Some of my attempts at sewing for my Sylvanian Families. I have also recently started adding some crochet pieces to this page. My favourite project! These glasses are super easy to make and look very cute on any Sylvanian Family member. My first custom repaint project - making a cheetah out of a Sylvanian Families bear. This project was my first attempt at laying down egg carton cobblestones. It was made on a mobile surface so that I can use it in photos. When I just started collecting in 2011, I was inspired by a fellow collector who was building her own village called Carrot Creek at the time. Although my own display does not even begin to match hers in scale, I hope that one day I will be able to inspire someone else with my ramblings. 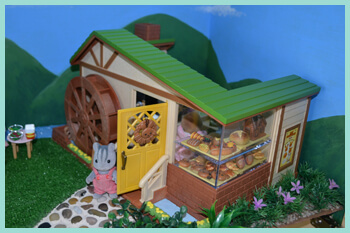 My first project in constructing my village, was my Watermill Bakery scene. This is my favourite building and the Appleblossom squirrels are one of my most treasured families. I received them from the collection of a fellow collector from the US and though it fitting that their shelf should be the first one that got my attention. My second project in constructing Rooibosch Hill! This one was really fun, I decided to do it because the Farthings are real jolly beach hounds and the whole family was received as gifts, little sister Farthing coming from Spain! The little snack carts are just too cute and I think the scene focuses a lot of well deserved attention on them as well.